where K is the Gaussian kernel K(u)=1/√2 π exp(−1/2 u2) and h is the positive real parameter called the bandwidth. The supported options are listed below. list (the default) : f is returned in discrete form, as a list of values f(a+k b−a/M−1) for k=0,1,…,M, where M is the number of bins. gauss or normal or normald : the Silverman’s rule of thumb is used for selecting bandwidth (this method is fast but the results are close to optimal ones only when f is approximately normal). bins=<posint> (by default 100) : the number of bins for simplifying the input data. Only the number if samples in each bin is stored. Bins represent the elements of an equidistant segmentation of the interval S on which KDE is performed. This allows evaluating kernel summations using convolution when output is set to piecewise or list, which significantly lowers the computational burden for large values of n (say, few hundreds or more). If output is set to exact, this option is ignored. [range=]a..b or range=[a,b] or x=a..b : the interval [a,b] on which KDE is performed. If an identifier x is specified, it is used as the variable of the output. If the range endpoints are not specified, they are set to a=min1≤ i≤ n Xi−3 h and b=max1≤ i≤ nXi+3 h (unless output is set to exact, in which case this option is ignored). 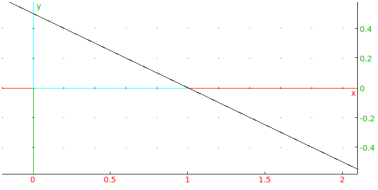 interp=<posint> (by default 1) : the degree of the spline interpolation, ignored unless output is set to piecewise. spline=<posint> : sets option to piecewise and interp to <posint>. eval=x0 : only the value f(x0) is returned (this cannot be used with output set to list). an unassigned identifier x (by default x) : the variable of the output. exact : the same as output=exact. piecewise : the same as output=piecewise.